Last sailing season, the Dynamic Duo of Destiny got together for a "small boat" trip (as opposed to breaking out Scout) and did a short but wonderful two day trip around mid-Casco Bay. We huffed out to Whaleboat Island which is managed by the worthy Maine Coast Heritage Trust. It was two nice days of sailing with a wonderful camp and picnic time. Straightforward. 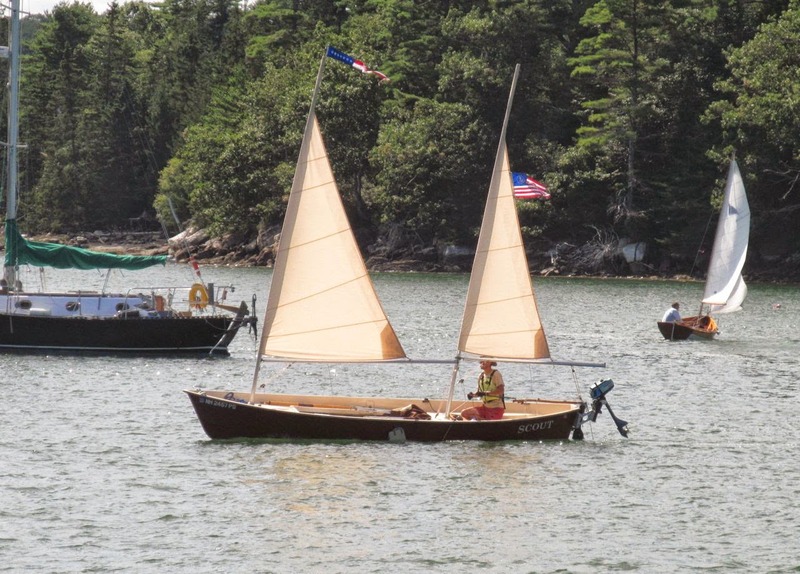 If anything, I remembered how nicely the Goat Island Skiff rows compared to the Sea Pearl 21. I have included a picture below with my new outhaul scheme for those interested. This is my NEW outhaul arrangement for the loosefooted mainsail. I love it! Extra line hangs from the higher reef points to accommodate the shorter foot. If you don't find a rockwall somewhere in New England, you're doing New England wrong. Under those clouds on the horizon is Mt Washington and the Presidential Range. No joke. We saw it clearly the next morning. Whaleboat Island has a mountain view. No comment. If Cap'n Jon is not camping with you, your camping trip is no good. We revisited FAMOUS BANGS ISLAND site of many a IAZ,P adventure! This is the North Beach. Christophe I have a very good feeling that I'll be able to get out with you guys at least once this season to explore the Calendar Islands! Hi - I've really enjoyed following your Maine Island wanderings. I have a Michalak AF3 that I built a few years ago, and was finally able to put my MITA membership to use and dip my bow into Casco Bay late last summer (I live about 3 hours due west of Portland). I'm hoping to do some more extensive exploring this summer. Great news, David. We'll hope to see out there!